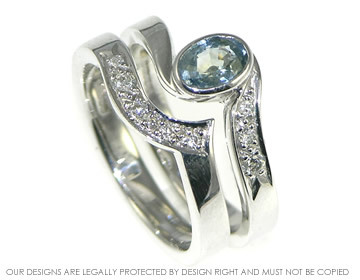 This wonderful wave-like form is forged from 9ct white gold with 3 graduated 1mm, 1.5mm and 2mm H SI diamonds in the engagement ring along with an unusual natural aqua coloured 0.59cts oval natural sapphire.This design is inspired by waves lapping over foam filled rock-pools. 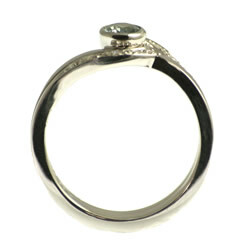 The wedding ring is shaped to fit around the engagement ring and holds 5 diamonds graduated between 1-2mm. 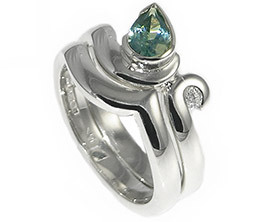 The wave design of the wedding ring means that it looks great on its own and also jigsaws perfectly into the engagment ring.The sapphire is very beautiful and intesting to look into - you get flashes of pale blue, green and aqua within it. 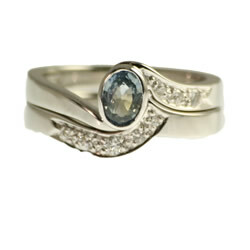 Platinum, diamond and sapphire engagement ring.